The Christian life is a process of renewing every dimension of our life—spiritual, psychological, corporate, social—by thinking, hoping, and living out the ramifications or the gospel. 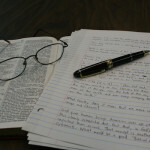 The gospel is to be applied to every area of thinking, feeling, relating, working and behaving. Instead of approaching discipleship as something beyond the gospel, apply the gospel to every area of life. Instead of giving advice about marriage, show the implications of the gospel on marriage. Instead of offering parenting insight, show how the gospel impacts parenting. Instead of looking for a new angle on giving and stewardship challenges, bring people to the gospel. Instead of tapping into the altruistic movements in society as motivation for serving, show how the gospel is the impetus for serving. And mission, and obedience, and forgiveness, and hospitality, and . . . The gospel impacts everything.